food bank | Ipswich Unemployed Action. Sanctions and Benefit Freeze Blamed for Rise in Food Banks Use and Growth in Mental Health Problems. The UK is a fairly hostile environment to be unemployed, but some might say the approach is starting to pay off. After all, unemployment is currently at its lowest rate in 42 years, with 109,000 more people entering employment in the three months to April this year. With numbers like that, some people might be wondering if aggressive tactics such as benefit sanctions are helping drive willfully unemployed people into gainful work. Yet that is not what the public spending watchdog believes. Last year the National Audit Office – the independent body that monitors spending for Parliament – declared that benefit sanctions are inconsistently applied across the country and that withholding payments pushes claimants into hardship, increasing their chances of experiencing hunger and depression. Now, the latest report by Oxford University and the Trussell Trust food bank network has revealed that almost 80 per cent of food bank users had experienced food insecurity in the previous 12 months, meaning they could not buy enough food and/or had experienced entire days with nothing to eat. The issue of price rises and insecure incomes are major factors in ‘food insecurity’. The former justifies our call for an end to the benefits freeze. The latter raises the issue of Universal Credit delays and Sanctions. Rates of severe anxiety and depression among unemployed people have soared by more than 50 per cent in the last four years as the impact of “harsh” austerity policies take their toll, The Independent can reveal. The UK Council for Psychotherapy (UKCP) said the Government’s reforms of welfare payments were to blame for the rise, as benefit cuts and sanctions “are having a toxic impact on mental health”. New analysis of data from NHS surveys of GP patients shows that in March 2017, 15.2 per cent of unemployed people said they suffered from severe or extreme anxiety or depression. This figure has increased steadily from 10.1 per cent in June 2013, and marks a sharper jump than rates of the conditions among the general population, which rose 20 per cent over the same period, from 3.4 per cent of people to 4.1 per cent. “The devastating impact of the benefits cap for families with children, the freezing of benefits at a time of inflation, and the cutting of benefits for the disabled are putting claimants under terrible mental and financial strain,” said Janet Weisz, the UKCP’s chief executive. A four-year freeze on benefits has been in place since April 2016, despite rising inflation, which hit 2.9 per cent last month. The austerity measure, widely recognised as a key driver behind forecasts of rising poverty to come, is expected to reduce support by £13bn by 2020, above the Government’s forecast of £9bn, according to research from the House of Commons Library. People claiming benefits can have their payments cut or stopped entirely if they miss one job centre appointment. The minimum sanction period was increased from one week to four in October 2012. About a quarter of people on Jobseeker’s Allowance received at least one sanction between 2010 and 2015, according to the National Audit Office, which warned last year that the Department for Work and Pensions is not doing enough to find out how sanctions affect people on benefits. These reports, signaled originally from the Independent, just about clinch the argument us lot have made here. End the Benefits Freeze and the Sanctions Regime! Tuesday 24th of March 2014. Independent. Food Banks Concentrated In Areas Hit Hardest By Benefit Sanctions, Study Finds (Guardian). Austerity policies such as cuts to welfare and local services are driving the rapid spread of food banks in the UK, according to an academic study. The Oxford University research shows emergency food aid is most concentrated in areas where there are high levels of joblessness and benefit sanctions. The Conservative-Liberal Democrat coalition persistently refused to acknowledge a link between its economic and social security policies and the explosion in food banks. But the Oxford study, published in the British Medical Journal, shows demand for food parcels is strongest where poverty is accompanied by restrictions on, and reductions in, social assistance. The study, which uses data supplied by the UK’s biggest food bank network, the Trussell Trust, finds food banks operated in 20 UK council areas in 2009-10. By 2013-14 they existed in 251 areas. At the same time, the rate of food aid distribution tripled between 2010 and 2013 from about 0.6 food parcels per 100 people to 2.2 per 100. There were stark variations between local areas, from a low of less than 0.1 food parcels per 100 people in Lichfield, Staffordshire, to a high of eight parcels per 100 in Newcastle-upon-Tyne. These in part reflected the fact that some areas had more or longer-established food banks, the study found. Even taking this into account, higher rates of food parcel distribution were still “significantly associated” with welfare cuts and austerity measures. In particular, the prevalence in an area of benefit sanctions – where unemployed claimants who do not meet jobcentre rules have their payments stopped for at least four weeks – was a strong indicator of food parcel use. A spokesperson for the Department for Work and Pensions said: “The government spends £94bn a year on working-age benefits and provides a wide range of advice and assistance for anyone in need of additional support. The lead author of the study, Rachel Loopstra, said it was likely to have “underestimated the true burden of food insecurity in the UK” because food aid provision is patchy and data collection is relatively crude. She called for further research to capture the full extent of food insecurity and food bank use in the UK. One of the last acts of the coalition was to reject a cross-party call for the government to collect robust data on food poverty. The study is the latest in a string of separate reports linking welfare reform to food bank use, from poverty charities, churches, MPs, and food banks. 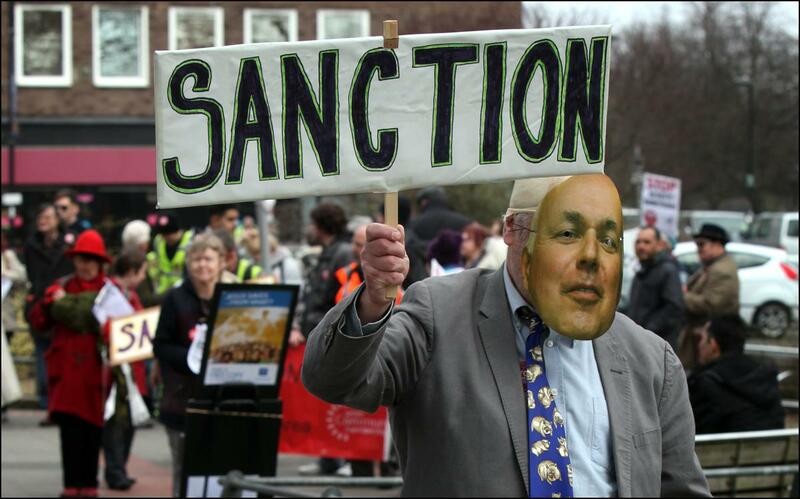 Message to the Labour Party: We need to Get rid of the Benefits Sanctions Regime. Full Stop. Hat-tips: Another Fine Mess and Enigma. A Labour government would tackle the root causes of the increase in the use of food banks across the UK, with the party to pledge that they “can never be allowed to become a permanent feature of British society”. Shadow ministers will promise to solve jobcentre benefit delays, halt the proliferation of benefit sanctions, and address low pay in a five-point plan aimed at reducing the number of people forced to turn to food banks. They will cite Trussell Trust statistics showing that nearly a million people used food banks in 2013-14, figures that are generally assumed to underestimate the number of people who went hungry as a result of food insecurity over the period. Labour will promise a cross-government approach to end what it calls the “chaos of food policy” under the Conservative-Liberal Democrat coalition, and will say that a Labour administration will make tackling food bank dependency a specific ministerial responsibility. A target would be set to reduce the number of people who cite delays in benefits being processed as the prime reason for using food banks. Benefits typically take around 16 working days to process, although backlogs mean many disability benefit claimants have waited for several months. Studies have shown that benefit sanctions – when payments are stopped for alleged rule infringements – are the prime reason for between 10% and 30% of food bank users being referred for food aid. Labour says it will abolish jobcentre targets for increasing sanctions, and make hardship funds more quickly available for those who are sanctioned. The party has a longstanding commitment to abolish the bedroom tax, which is also driving food bank use in some areas of the UK. It has also promised to address low pay, by raising the minimum wage to at least £8 an hour before 2020, promoting a Living Wage and ending zero-hours contracts, so that working people do not suffer the humiliation of being referred to food banks to put meals on the table. Ending ‘targets’ (which the DWP under their Masters’ instructions lie their way away out of existence in any case), and a vague commitment to deal with ‘benefit sanctions’ is not enough. What is wrong is not just their ‘proliferation’ but the rotten system that has left one in five claimants punished. I am not sure how we reached the point where we need an inquiry to establish that stopping a person’s benefits to the level that they can’t feed themselves or their children may be wrong. But here we are, it seems. The recent MPs’ inquiry into the coalition’s benefits sanction system released its findings on Tuesday – a catalogue of cruelty with footnotes to add details of the claimants who have been starved. The report is damning. As it should be. We have watched a system develop in which it is normal for ordinary men and women to be thrown by their own government into financial and psychological crisis. The scale is staggering. More than 1 million jobseekers had their unemployment benefits stopped last year – and, as the report states, the government has failed to prove this is not “purely punitive”. Who exactly are we punishing? A disabled, single mother described to the committee the day she was sanctioned for missing an appointment because a flare-up of her hip condition meant she was physically unable to walk or drive. Despite explaining this to The Department for Work and Pensions (DWP), she was told she’d receive no money for four weeks. The sanction remained in place for almost three months. Exactly right: we should boil with rage that somebody is left at her wits’ end because of a punishment more that’s more like a court’s fine for criminal activates than the workings of a welfare system. This is not being done to the middle classes with savings in the bank. Or those with power who are used to navigating a complex system. It is being done to the people who are already struggling – where a hardship fund exists but the application process is designed to be too difficult for vulnerable people to understand. Or, as the report states, making it so “the people potentially most in need of the hardship system were the least likely to be able to access it”. Doubleplus right: this is being inflicted on people (and most of us know them, or are them) who have no resources. The bastards are making our sisters and brothers suffer to fit in with Iain Duncan Smith’s plans to ‘reduce’ welfare dependency’. They are pawns in his game. The MPs’ call that an “independent review of benefit sanctions is urgently needed” seems almost polite for what is going on here. People are literally starving and their crime is that they dare to be poor and unemployed. It is no surprise that the report concludes there is limited evidence that benefit sanctions actually help people find work. A jobseeker system that has sanctions at its centre is founded on the lie that the unemployed are too lazy to look for work unless they are threatened. The DWP acts as if it is training disobedient dogs. Stopping the money people need in order to eat is not the purpose of government. The benefit sanctions regime should be scrapped – but let’s not stop there. The culture that created them needs shredding to pieces. This is the kind of ‘equality’ we are now living in: “In its majestic equality, the law forbids rich and poor alike to sleep under bridges, beg in the streets and steal loaves of bread.” (Anatole France). Tripleplus right: Get rid of the regime and bring the authors of this system to justice!